At our Community Open House, you’ll have a chance to visit our newest experiments and historic sites, view a live videocast from our international partners, experience a cryogenics show, visit our art gallery or tour the building where history will be made when new physics is discovered. Hike through our restored prairie, view the bison herd, meet with local STEM organizations, and enjoy all of the activities that the day has to offer. The listings below provide times and places for all the tour and visit stops, as well as the bus routes that can take you to the point of interest. See the Open House map to view the tour and visit stops as well as the bus routes that can get you from point to point. Follow along with the Open House and share your own experience using #Fermilabs50th or by tagging @Fermilab. While at tour stops, try out our special Open House Snapchat filter! 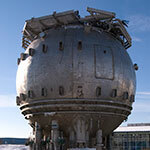 Take a photo of an unusual-looking device and one of our first particle detectors, a 15-foot bubble chamber. Then learn about cleanrooms and state-of-the art particle detectors based on silicon technology. This tour is on the orange bus route. 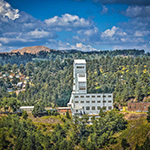 The 36-foot-long state-of the-art superconducting devices tested in this building are destined to be part of the most advanced X-ray laser facility in the world now under construction in California. The prototype for a cutting-edge superconducting proton accelerator planned to be built at Fermilab is also located here. Industry, medicine, homeland security, science: More than 30,000 particle accelerators are in operation around the world. 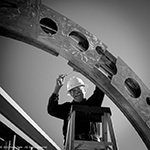 In this facility we are building and testing the best of the best. Come see the different technologies we’re developing for the next generation of particle accelerators. In the Heavy Assembly Building, you’ll find accelerator and detector test facilities. One is the magnet test facility for the Mu2e experiment (which you can see more of at the Mu2e Building). You’ll also see test stands for other accelerator components. This tour is on the green, orange and red bus routes. This is where it all starts: The Linear Accelerator Gallery, located south of Wilson Hall, is the beginning of Fermilab’s accelerator chain. 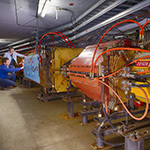 From here, particle beams are generated and accelerated to higher and higher energies before being sent to the lab’s experiments at close to the speed of light. 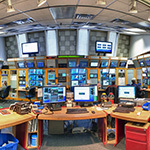 Learn the different stages of particle beam acceleration, and see the lab’s Main Control Room, where staff monitor beam operations 24 hours a day, 365 days a year. This stop is located in the Wilson Hall tour area, which is accessible from all bus routes. Learn more about Fermilab’s next muon experiment, Mu2e, to search for hidden subatomic forces and see how particle detectors record cosmic rays that constantly bombard Earth. Mu2e is an ambitious effort to discover new physics using particles called muons. This brand new building is oddly shaped, with labyrinths, nooks and crannies. The tour will feature a look around the building, an introduction to the experiment, and a display of common detector technologies used to perform experiments here at Fermilab. This tour is on the blue bus route. Take a look at the experiment that includes a 50-foot-diameter magnet that arrived from Brookhaven National Laboratory in 2013. (You might have seen it on TV or in the newspapers.) Muon g-2 is the newest experiment to come online at Fermilab. It uses a beam of subatomic particles called muons to study the laws of nature at quantum scales. Take a walk through a short section of an accelerator tunnel and see the Muon Delivery Ring and beamline for the Muon g-2 and Mu2e experiments. 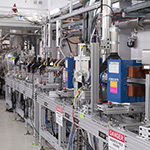 See accelerator magnets and instrumentation, and learn all about how particle accelerators work. Note: Tour area is accessible only by two flights of stairs. It is in an underground concrete tunnel, but is not cramped or confined. All participants, including children, must be able to climb and descend stairs independently. See our latest neutrino detector, ICARUS, which arrived from CERN this summer and which will join the laboratory’s Short-Baseline Neutrino Program. 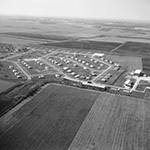 This program includes the MicroBooNE detector and the future SBND. 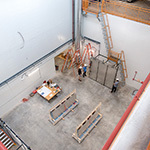 Also discover why we are building an even larger, 70,000-ton neutrino detector a mile underground in South Dakota, called the Deep Underground Neutrino Experiment. 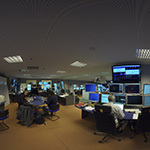 Wilson Hall houses two remote operations centers: ROC East is the control room for the CMS experiment at CERN’s Large Hadron Collider in Switzerland. 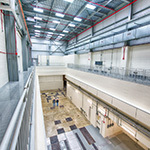 ROC West is the control room for our many neutrino experiments located here in Illinois and in northern Minnesota. See how Fermilab scientists monitor particle physics data from afar. These stops are located in Wilson Hall, which is accessible from all bus routes. 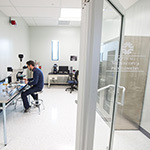 At Industrial Building 3, you’ll get an overview of our research in the area of superconducting magnets and superconducting radio-frequency technology, the technology of choice for future accelerators. See giant magnets, and learn how superconducting cables are manufactured. 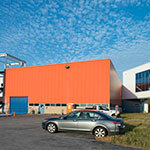 The Industrial Center Building houses components destined for the LCLS-II accelerator at SLAC National Accelerator Laboratory in California. Learn about LCLS-II, our accelerator magnet and cavity test facilities, and the material science behind these cutting-edge advances. Take a tour of the 15th floor, and view the Fermilab grounds from the highest vantage on the lab campus. Tours are offered continually throughout the day (see below for times). This tour is a ticketed event. Visitors may pick up their tickets at the Wilson Hall information desk. Tickets are available on a first-come, first-served basis until they are gone. Tours begin at 10; 10:15; 10:30; 10:45; 11; 11:15; 12:15; 12:30; 12:45; 1; 1:15; 1:30; 2; 2:15; 2:45; 3; 3:15; 3:30. Two additional tours are available in Spanish. Dos tours están disponibles en español: 11:30; 2:30. This stop is located in Wilson Hall, which is accessible from all bus routes. We’re bringing live feeds from our remote national and international partners to you! 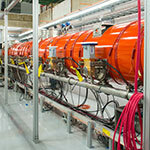 Check back for the schedule of feeds from CERN, the Dark Energy Camera and Sanford Lab. CERN laboratory in Switzerland is home to the most complex machine ever built, the Large Hadron Collider. Fermilab partners with CERN on the CMS experiment, one of two experiments that discovered the Higgs boson. 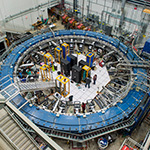 See the CMS experiment and facilities through a livecast and connect with our partners across the Atlantic. 11:50 a.m.-12:10 p.m., 12:30-12:50 p.m., 1:10-1:30 p.m., 1:50-2:10 p.m. The IARC Lecture Hall is on the orange, green and red bus routes. For four years, the Fermilab-built Dark Energy Camera has been surveying the southern sky from a Chilean mountaintop. 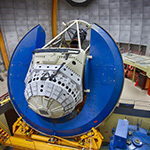 We bring the mountaintop observatory to you through videocast. 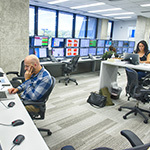 Connect with our colleagues in Chile to see the control room and giant camera, which is looking for evidence of the force that is accelerating the expansion of our universe. 11:50 a.m.-12:10 p.m., 12:30-12:50 p.m., 2:30-2:50 p.m., 3:10-3:30 p.m.
Wilson Hall is on all bus routes. Our flagship megascience experiment, the Deep Underground Neutrino Experiment, will send a beam of neutrinos from Fermilab all the way to a giant particle detector in South Dakota at the Sanford Underground Research Facility. Get a glimpse of the former gold mine in Lead, South Dakota, and see a bit of where the future detector will be built through this videocast. 10:30-10:50 a.m., 11:10-11:30 a.m., 1:10-1:30 p.m., 1:50-2:10 p.m. Ask a scientist your burning questions about the universe! 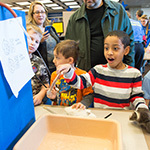 We’re bringing our popular monthly Ask-a-Scientist program to Open House. Satisfy your curiosity about the Big Bang, how a particle accelerator works — even how particles work — at our Ask-a-Scientist station located in the Wilson Hall atrium. Available in Spanish. Disponible en español. Chicagoland is an exciting center of science in the United States. Visit our Chicago STEM Fair, where local universities, science organizations, museums and companies show off their science and education advances. 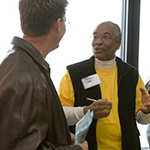 Chat with representatives, and make note of places you might want to explore further. IARC is located on the orange, green and red bus routes. Enjoy a hands-on, interactive exploration of the interdependence of forces and motion that we encounter in our lives every day. 10:30 a.m., 12 p.m., 2 p.m. The 12 p.m. show is available in Spanish. Èl 12 p.m. show está disponible en español.disponible en español. The Lederman Science Center is located on the green bus route. Our education programs serve 50,000 K-12 students every year, on site and in the classroom. 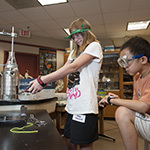 Children and families visiting the Lederman Science Center will engage in a variety of hands-on physics and nature activities both inside the building and on the grounds of the center. Mr. 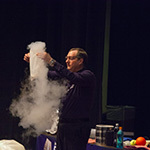 Freeze demonstrates the very cool effects of liquid nitrogen in this exciting, kid-pleasing 45-minute show. Tickets are required to attend. Tickets will be available at the Wilson Hall information desk from 10 a.m.-2:50 p.m.
10:45-11:30 a.m., 12-12:45 p.m., 1:30-2:15 p.m., 3-3:45 p.m.
Wilson Hall is located on all bus routes. Fermilab 2017 artist-in-residence Jim Jenkins discusses his residency artwork, inspired by the science at Fermilab. Interested in learning about artist Angela Gonzales and her contribution to Fermilab? Georgia Schwender presents on Fermilab’s first and only artist, whose work — prints, report covers, the laboratory color palette — leaves its indelible imprint on the Fermilab aesthetic to this day. 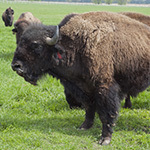 Come see our bison herd and meet Fermilab’s bison expert Cleo Garcia. You will see between 17 and 20 mature bison and 10 to 15 calves. Bison are not domestic animals, so this is a unique opportunity to see and learn about them. The bison viewing area is on the orange, green and red bus routes. How did the lab start? What has it discovered? Who designed the lab’s iconic logo? Where did the bison come from? Find out the answers to these and other questions at a talk by Fermilab Archivist and Historian Valerie Higgins. 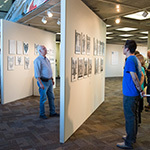 11:50 a.m.-12:50 p.m., 2:30-3:30 p.m.
Visit the Fermilab Art Gallery on the second floor to view the artwork of Angela Gonzales, Fermilab’s first artist, who created Fermilab’s visual identity, including the laboratory logo. Compass plants, tall prairie grass and monarch butterflies are some of the things you can experience while walking a short or long loop along our interpretive prairie trails. So get outdoors and into the prairie! 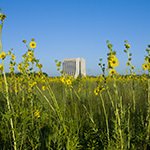 Come and learn the history of the Fermilab prairie restoration project — at one time the largest on Earth. The head of the trail is on the green bus route.